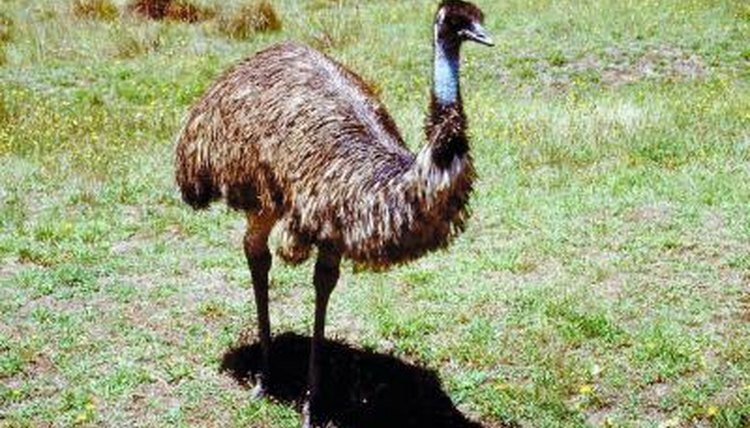 Emus (Dromaius novaehollandiae) are large flightless birds native to Australia that belong to a primitive group of birds known as ratites. The bird is found throughout Australia, although it avoids cities, deserts and dense forests, preferring savannah woodlands and grasslands. Emus are farmed for their oil, leather and meat, and were imported into the United States from the 1930s through the 1950s. Today, the exportation of live birds and eggs is prohibited from Australia. When hatched, emu chicks stand about 10 inches tall. At the age of 3 months, they are 24 inches tall, and at 6 months, about 54 inches. Large adults can grow to more than 6 feet tall and 4 feet wide at the shoulders. Emus mature at around 2 to 3 years of age, and adults weight between 65 and 100 pounds, with large specimens reaching 130 pounds. An emu is smaller than an ostrich, but larger than a rhea or kiwi. Emus have long brown and gray plumage with a shaggy appearance and downy feathers on their heads. Long necks have pale blue skin, visible through sparse neck feathers. A unique feature of emu feathers is the double rachis -- a double shaft that emanates from the single main shaft. Small pointed beaks are adapted for ease of grazing. Two vestigial wings have small claws at the end. The only birds with muscles on the backs of their legs, highly specialized pelvic limbs and three toes on each foot, emus are able to reach speeds up to 30 miles per hour. These are loud, vocal birds. Females produce a booming noise through an inflatable neck sac, while males grunt -- both can be heard from more than a mile away. They tend to travel in pairs, although will occasionally form flocks. They are daytime feeders and sleep at night, although not continuously. These inquisitive creatures are known to approach and follow humans. Most migrate seasonally. Females lay eggs which the males then incubate for about eight weeks. These omnivorous birds eat plants, grasses, fruits, berries, caterpillars and a variety of insects. Because they have no teeth, they also must consume pebbles and stones to assist in digestion of plant material. They drink infrequently, but consume large quantities when they do.